Baba...You know what is going on in my mind these days and how frustrated I' am. Baba..I trust you...pacify my mind and give a sense of peacefulness. Thanks a lot baba for being with us during some of the toughest periods of life. We expect few more tough periods in the future and please baba be with us right through. Forgive me if I have done any harm (even mentally)to any one. There are few people whom I don't want to meet in life, but apparently it looks like they are gonna placed right besides me. Baba.. i trust you..Calm my agitated mind and give me peace. My thesis writing and the final round of work is going very slowly..baba be with me and you finish it for me. Only thing i want in life is peace of mind..Please baba grant me one. 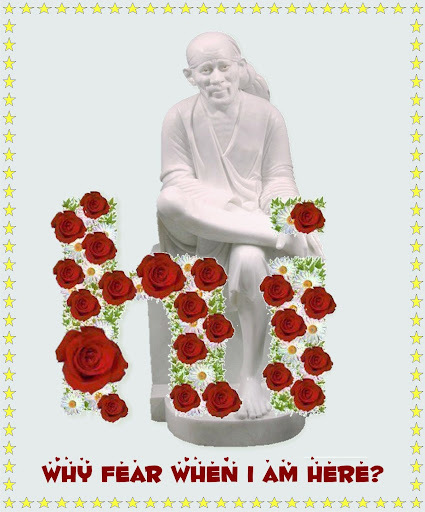 Bless all the devotees Baba..give all of them joy and happiness. Dont worry at all. Just keep thinking of baba and recite his name "Sai Ram" when ever u r out of ur mind. I too had the same problem of many unwanted thoughts creeping into my mind and i bcame half mad. Nowdays, i have put all my sufferings in the feet of baba and pray to him all shld go well. This is really working. The moment u think of him, u will gain tremendous amount of belief that makes u forget about ur sufferings. Read Sai Charitam and leave everything to baba...He will surely take care of his children...have belief that he will never let us suffer. keep chanting our Sai's naam. and never worry how to solve it also.Everything our SAI will take care. All I request you to chant SAI SAI SAI. Nothing can come your way and harm you. We will all pray for your completion of your thesis. Page created in 1.018 seconds with 37 queries.